This is going to be a very personal post. 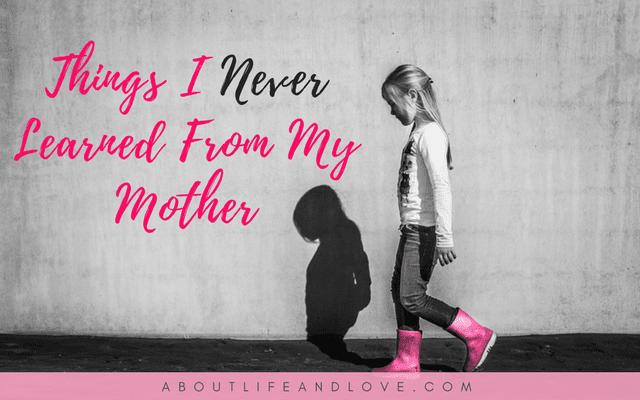 I'm going to share the things I never learned from my mother. It wasn't a normal childhood. It's rather difficult to explain why, but you might understand if I'll share the things I never learned from my mother. What I know, I learned from her. Indirectly that is. Try as I may, I can never remember a time or conversation I have with my mother when she was kind to me. Or to other people for that matter. Which made me realize that kindness is innate in every human. Because though I never experienced nor witnessed kindness in the early years of my life, I knew I wanted to be kind. I knew I can choose how to treat others. To be kind or to be hostile is a choice. Of course, I can be belligerent because that's what I'm more familiar with. But my system rejects it. Maybe because I know how it feels to be at the receiving end of hostility? So I choose kindness. I've never learned my real worth from my mother, but it is through her that I learned how valuable I am. I never knew how important I am for a long time. I didn't know I matter. I always thought I'm "good for nothing" and that I am a waste of space. My mother never taught me that I am fearfully and wonderfully made. That I am enough. That I deserve to be loved. That I deserve respect, and that I am special. But, now I know. Thanks to self-help books, spiritual community, loving friends, and God's relentless and unconditional love; I am now fully aware of how precious I am. I used to have money problems. I could never save money. I witnessed my mother spend all the family's fund on the most frivolous things. I never saw her plan our budget, or spend wisely. She is the total opposite of frugal. My desperation to get out of the rat race---that is living from paycheck to paycheck---made me seek help with my finances. I gobbled all financial management and investment knowledge I could get; I read books about finances, I attended seminars on stock market and mutual funds. I disciplined myself and applied the knowledge I've gained. Jim Rohn said, "Everyone has to get good at one of two things: planting in the spring or begging in the fall." I may not be a millionaire yet but at least I'm sure that I won't be begging in the fall. I never learned that from my mother. Despite my mother's spending habits, she is stingy when it comes to others. She detests charity works, and she's never generous even to her own family and children. I remember she provides us our needs (with my father's money), but she never gives us a little extra to enjoy life. I had really lame projects in school and I never get to go out with my friends as often because she doesn't want to give me money. Sometimes she does begrudgingly. I learned to be generous to those who don't have enough because I know how it feels to not have what you need, or to enjoy the little things in life. All thanks to my mother. I've realized that it's important to make time for your kids and get to really know them. No matter how busy you claim you are, your first priority and most important ministry is your kids. Spending time with your children will spare them (and you) the many struggles in life like feeling inadequate, getting lost, and getting into trouble along the way. And you don't get swayed when you hear rumors about them. Undoubtedly, I have learned a lot in life, because my mother never taught me a lot of things. At least not directly. So I realized as I grow older that I can either suffer the consequences of other people's actions and be miserable, or learn from it and be better. I see how my mother lives her life, and I tell myself that's not the kind of life that I want for myself. Or that I don't want my future kids to experience what I went through. So I made a decision. Life is what I make it. I can live my life being condescending and unkind and inconsiderate of others, be carelessly lavish and selfish, or be...different. In a good way. Our mothers may have the strongest influence on us, but we get to choose how to use that influence. That choice will determine who we become and what kind of life we will live. As for me, I chose to turn her influence around and opt for what's best for me. I chose to learn and discover the things which I never learned from my mother. What are the lessons you learned from your mother? I appreciate your bravery and honesty. Many of us never learned our value from our parents. That a big point of my book - love yourself. We're not taught that as kids. So we have to start learning it as adults and correcting all the messages that were hard-wired. I want the world to start teaching its children this message. Thanks for being so genuine, Lux. I'm glad you've been on the path of self-love. Sometimes we learn a lot of things as we grow up from our mother,father and others but ultimately it is up to us to chose the path we are going to follow. Such an interesting and honest post... I'm sorry that You haven't learned a lot from your mother. I love the first quote of mother Teresa! i'm sorry to read that your mom had not shown these qualities to you, but i admire how you've taken what could have been negative and turned it into positivity. and it makes me appreciate my own mom more, for her hard work and how she prioritised her children. I admire your authenticity, Lux and the strength you've shown in making your own way in life. I'm not a mother, so I seem biased. However, I feel that the idea of a mother being a saint is highly overrated. If all mothers were as wonderful as they'd like us to believe, the world would be a happier place. I send you hugs that is one of the things I learn from my mom and sorry that you did not get to experience with your MOM but maybe your mom it's the way she it's because she learn it from her parents. You are smart to know you want the opposite for your future kids breaking the chain of habit it's the first step. Wow...this could be my life story too!! My relationship with my mother is so like yours. Maybe we had such difficult relationships with our mothers like these in order to learn to be stronger, to stand on our own two feet (as the wise would say!). I guess, at the end of the day, mothers are only human too...and I'm sure they never really meant to be cruel...well, I like to think of it that way! Thank you so much for sharing this...it will help many others like us. Very interesting post my dear.Relations mother with her daughter can be very difficult.. I never heard from my mother's words of love, she never hugged me.So I had to learn how to show others my feelings..
How amazing that you figured things out on your own based on what you didn't get. You are a gem! I like that statement plant in the spring or begging in the fall. Very deep. Will use that. Have a lovely weekend. I'm sorry you had such a rough start. These things are really helpful when one is growing up. We can't choose our mothers so good on you for making the best of it and learn good useful things without being influenced by your mother. Wow!! what a powerful post! So many deal with this! I'm one of the lucky ones. My mom, in the middle of awful abuse taught me all those things and then some. While she worked hard her entire life, we never had a lot but she was always willing to help others. If I was/am half the mom my mom is, I will be very proud of myself. Thank you for encouraging moms to focus more on the truly important things. Thank you for your vulnerability. I so wish it could have been different growing up for you but you learned some very important things that I'm glad you shared today. May we all pay attention! Sending hugs! I love this post. My mom is such a wonderful person, but my dad struggles, for lack of a better way to put it. I hate when people blame all of their issues on what happened in their childhood, because I agree with you in that you can CHOOSE what you want to be. Hi Lux, this post is very impressive and honest. You're a special person. I've always said that I am who I am in spite of my mother. Maybe I became who I am because of her. Never looked at it that way. She really was a horrible person. Not sad that she is gone. Great post Lux. Wow this was a poerfeul post. Probably I learned from my mom how to be a tidy and clean girl and how important is that in our image. But are so many things I never learned, for example that about manage my finances or how I express my feelings to a guy or how is that interaction probably some moms give to her daughters tips about relationships but I never received from my mom any single advice about this topic. I learned almost everything I know about so many things thanks to the books or the life itself. My mom never teached me how to be reserved about myself my feelings and my stuff I learned that all by myself and because in the past I found bad people that treat me very bad. Thank you for this inspiring post! I appreciate the truth you share here -- I'm afraid that my own mum has been that kind of example to me as well, and I think it's a very powerful thing to choose to go in a different direction from what you have seen and known. It doesn't end here, Lux. As I have seen my mum age and the impact her choices have had on that process, I am resolved to be a different kind of Old Lady, a different kind of Grandmother. Blessings to you on your beautiful path. When I was growing up, I wished I was born to a different set of parents. I was made aware that my own parents lack a lot of qualities that are needed to raise a child in his/her best version possible. There's more to parenthood than working to feed your children. But I realized, there's no use regretting over something that can no longer be undone. So I took charge of my own learning and persevered to lead a different life. We cannot always choose what our circumstances are, but we can certainly choose what we do with them. My parents are the biggest people who came to my life as lessons. Wow! This is such a raw and authentic post. I`m sorry you had a not so good childhood but you turned it around and now you are one awesome and smart lady. I learnt from my mom unconditional love, she would love people even when they hurt her. Wow--I love your attitude of turning things around. That is so difficult to do. I'm assuming it took you years to do it and the help of the Lord! But now here you are helping others of us. I was blessed with a good mother, although she had her flaws. She taught me many things too, some by example, some by words, some by things I did NOT want to do. Thanks for sharing all this! Sorry you never had the chance to learn those things from your mother, but I'm glad you've been able to learn them now in other ways and that you have found the strength to make different choices. Minha mãe nunca me ensinou que bondade demais atrapalha! Don't forget her secret recipe too. My mother taught me bravery and independence- modeling them for me in the hard parts of her life. Whatever choices I make, I know I've seen those two traits in action. I'm sure I'll think about your words for the rest of the day. Thank you Lux! I'm sorry you didn't get to learn these things from your mother but it's amazing how you still learned them on your own and very importantly learned your worth. I'm sorry you had a rough childhood---you deserved more love and attention than you received. I like that you have turned these lessons into something positive, and one day it will make you a great mother! Observing others whether they be our parents, teachers, friends, we can learn from their mistakes, or successes, and choose a way pleasing to God. I am glad you have made wise choices in life and are seeking to be kind, generous, wise with your money, and just plain happy. Keep focused on the Bible and on Jesus and the way will always be clear. Thank you for sharing your insightful post with us here at Tell me a Story. You definitely learned a lot from your mother. Actions do speak louder than words. I'm happy for you that you were overcome a difficult childhood. I did not have the greatest relationship with my mother, but looking back on it, I realize she tried her best. I was probably not the easiest child to get along with - being the eldest I had to test the waters...I made a lot of waves! such a strong post ! please check you mail ! I really admire how you've turned something less than pleasant into such a positive. ''To be kind or to be hostile is a choice'' - that's undoubtedly the best thing I've read in a while, how very true. I think the greatest thing I've learnt from my mother, would be to always consider the other person's point of view. Some of us had bad childhood and thank God, we didn't turn out too badly. Thanks for the frank sharing of your early life. life is what you make it. this is really true and my mother tough me same think! Such a tough post to write, lady- but you're so brave! And even though you may not have learned these values from your mother, you HAVE learned them. And that's what is important! oh, i am so sorry to hear that your mother did not teach you these things!! however, it is incredible the way you have written and expressed all of this. way to go for overcoming and growing despite it all!! i think that's sooo amazing!! Thanks for your transparency. When we grow up with hard circumstances we either repeat what we have known or determine to never repeat it. I am so glad that you have been able to see that you have the choice to choose to live life differently. I am holding you up in prayer tonight. You are a strong woman, being honest with yourself already made you stand out from others. I do not have a very close relationship with my mom, I thought it is like that for everyone else, but I do think my mom is a strong woman as well, despite the financial hardship, she stays strong and keep going, maybe that is why she hardly smile, life wasn't too easy for her. My growing up years were full of so much negative that I knew by the time I got out of there what I did not want to be. It took till I got saved to find a complete different way of living that was not void of trials but full of wisdom and joy. Brave post. My mother isn't a Christian (yet), but she raised me with love and taught me kindness. But I definately have learned my true worth and value from Christ. Thanks for sharing this thought-provoking piece over at our Snappin' Saturday Share - 42 last weekend! Our mothers are a lot alike. Unfortunately, I did not realize a lot of what I didn't learn from my mother until after I turn 50 years old. I'm sorry to hear this. Quality time is indeed important, which is why I try to visit my mom as often as I can... even though I'm living in another city right now. I'm so sorry there were so many things you missed learning from your mother, but I'm glad that you were able to indirectly learn them. I think my mother has done a good job with teaching me all that I need to know. The only thing is that it's okay to cry sometimes. My mother is a very strong woman, more likely to bottle down her sadness and push on with the day.